Why Are Relations Tightening Between China and Turkey? 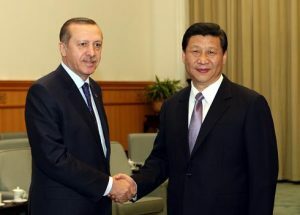 Home » Perspectives Papers » Why Are Relations Tightening Between China and Turkey? EXECUTIVE SUMMARY: The volume of trade between China and Turkey grew significantly in the first decade of this century. The countries’ relationship is now strengthening further, reflecting Turkey’s interest in participating in the BRI and the Chinese leadership’s struggles with its Uyghur minority. Judging from recent declarations, it appears the relationship will hold up, as neither side has viable alternatives to this alliance. Relations between China and Turkey have always had their ups and downs. When they established diplomatic relations in 1971, they made no effort to establish a deeper relationship. In the last decade of the 20th century, relations improved, and there was even the start of limited military cooperation. In the first fifteen years of the current century, the volume of trade between the countries grew significantly, from $1 billion in 2000 to roughly $30 billion in 2015. The countries are now experiencing a further strengthening of relations, reflecting Turkey’s interest in participating in the BRI (Belt & Road Initiative) and the Chinese leadership’s struggles with its Uyghur minority. On August 3, 2017, the two countries’ foreign ministers, Mevlüt Çavuşoğlu and Wang Yi, met in Beijing to discuss relations. At the end of the meeting, the Turkish minister stated that the Turkish government will refrain from publishing anything that could be interpreted as anti-Chinese in the Turkish media, claiming that China’s security relies on Turkey’s. The particular subject under discussion was newspaper articles about China’s Uyghur population. This declaration was made just over a year after the failed coup attempt against the Turkish president. Since that time, the Turkish authorities have closed down about 150 media outlets, and around 160 journalists have been imprisoned. These threats to Turkish freedom of the press were made with the express purpose of getting closer to the Chinese, and it is with that end in mind that Recep Tayyip Erdoğan is willing to completely change his attitude towards the Uyghurs. The Uyghurs are an ethnically Turkish Islamic-Sunni minority living in the Xinjiang region in northwest China. This minority is in constant conflict with the central government in Beijing over its demand for a separate and independent state. Hundreds, perhaps thousands of Uyghurs have fled Xinjiang for Turkey, a country many of them view as friendly due to their common religious and cultural foundations. The regime in Beijing has warned time and again that some of these refugees, the precise number of whom is unknown, are members of Iraqi and Syrian terror organizations who might return to China to execute acts of terror. The Chinese argue that reduced exposure to the phenomenon in the Turkish media might help fight it. The Turkish president has said in the past that “the Uyghurs represent Turkey’s original, ancient culture,” has seen himself as their protector, and has attacked the Chinese regime many times for its manner of dealing with them. In 2009, for example, Erdoğan said in response to violent riots in the Xinjiang region that the events were genocide, and called on the Chinese government not to be a mere bystander. However, in the past year, Erdoğan has changed his tune. He initiated the tightening of relations between the sides, the peak of which was the meeting of the foreign ministers and the Turkish declaration of China’s security being tied to Turkey’s. Erdoğan’s change in attitude towards China in general and the Uyghurs in particular might come at a cost to the religious-nationalistic movement in Turkey, which comprises his main base of support. It remains to be seen whether the Turkish president will try to play both sides – one towards China and the other towards his own supporters. Erdoğan knows full well that Turkey’s geographic location, a continental connection between Europe and Asia, is extremely important to the BRI, and could therefore result in closer Turkish cooperation with China and thus greater power for him. It is this calculation that brought him to look towards the future rather than the past with regard to the Uyghurs. Furthermore, the American failure to solve Middle Eastern conflicts and its surrender to Iran on the nuclear deal have substantially dampened Turkey’s interest in being part of the bloc of countries traditionally led by the US. Ankara’s repeated failure to be accepted by the EU has pushed the Turkish leadership to the understanding that Turkey simply does not belong to the group of countries usually referred to as “western;” i.e., countries with western values. The fact that more and more content is being blocked by the Chinese internet, and that the usage of VPN networks, which allow online shields to be bypassed, will also soon be forbidden, illustrates the reality that the Chinese leadership has no problem limiting media freedom. Erdoğan, a kindred spirit in this regard, has elected to disregard any criticism from Turks who see the Uyghurs as brothers – a decision that was clearly coordinated with the Chinese authorities. In return, China may well contribute significantly to Turkey’s economic prosperity. As the Turkish regime is already busy limiting the freedom of its media, it need not go to any great lengths to win China’s approbation. Time will tell whether the Turkey-China relationship will be sustainable, and whether Erdoğan’s base of support will allow him to get away with enjoying the fruits of tightening relations with China at the cost of the Uyghur minority. Recent declarations suggest that the alliance may well hold up, as neither side has many viable alternatives. Roie Yellinek is a doctoral student in the department of Middle East studies at Bar-Ilan University, a freelance journalist, and a fellow at Kohelet Policy Forum.